Curriculum-based school assembly programs that encourage kids to read! At Tommy Johns Presents our mission is simple: to create and deliver educationally significant assembly programs that encourage kids to read. Reading is the foundation of a great education, and opens the door to learning in every discipline. To this end, every program we offer inspires kids to read books. Our elementary school assembly programs cover a wide range of state mandated curriculum and testing areas including: science, geography, social studies, character education, writing and of course reading. Our interdisciplinary approach allows us to creatively teach a variety of topics in a fun yet systematic way. For information about Summer Library Programs, click here. We now offer Young Adult programs for public libraries. 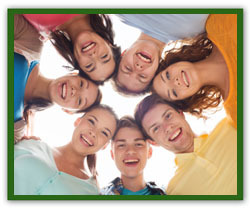 Click here for more information about our offerings for these teens. Tommy Johns Presents also offers a number of teacher tested continuing education offerings (teacher in-service workshops) on a variety of topics. Click here to find out more! Thank you for choosing Tommy Johns Presents. 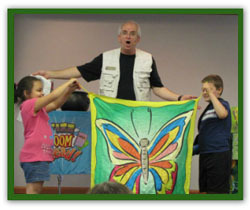 We have been entertaining, educating, and motivating audiences of all ages for more than 30 years. Be sure to check our current schedule to see when Tommy will be in your area. Or choose an open date and start something in your district! “Tommy is a delight to work with, from start to finish. I appreciated the information he sent ahead of time — everything from posters to tax forms included in one packet. I appreciated his flexibility — he was able to change the time on one of our shows at the last minute, and he was also willing to work in another show the same day for a community group. Most of all, I appreciated the way he interacted with the kids before and after the program. He has a magic touch, in more ways than one. Virtually any question you could ask can be answered on this site, but if you are in a hurry you can view our FAQ’s. Otherwise, take a few minutes and read through the site. Or just give me a call. I love to talk and listen!